Bea Day Plumbers, Inc., Iowa City, IA (1-10 employees). AFLAC Incorporated, Columbus, GA; A.J.’s Auto Repair Inc., Salem, OR; Peoria Charter Coach Company, Peoria, IL; ROEL Construction Company, Inc., San Diego, CA; Thermagas, Inc., Wichita Falls, TX; Toledo Metal Spinning Company, Toledo, OH; and, Tuckahoe Creek Construction, Inc., Richmond, VA. The winners were announced at a special awards ceremony held in conjunction with the International Assembly of Better Business Bureaus in San Diego. “The Better Business Bureau system established the Torch Award in 1996 to promote ethical business practices and to heighten public appreciation for the many fine businesses that serve our marketplace. It is our hope that this year’s winners will serve as shining examples to companies large and small who are seeking success. The 2003 BBBs’ International Torch Award for Marketplace Ethics honorees are proof that businesses that do right, will do well,” said Ken Hunter, president and CEO of the Council of Better Business Bureaus (CBBB). An expert panel drawn from academic, public service, business and ethics sectors judged the 2003 competition, which featured entries from 19 states. The Judging: The finalists and award-winning companies were selected by an independent panel of business ethics experts: Joan Koebernick, owner of Dakota-K Auto Repair & Tire Center in Arlington Heights, IL (winner of the 2000 National Torch Award); Thomas J. McBride, director-ethics & compliance, National Grid USA Service Co. (winner of the 2002 International Torch Award); Ronald Miller, a senior consultant with the Better Business Bureau of Central Ohio’s Foundation; Dr. Laura Nash, senior research fellow, Harvard Business School; and Dr. John Yost, professor, Bradley University. Award Criteria: Companies were evaluated against criteria that included commitment to and demonstration of ethical practices in the marketplace; high standards of behavior toward customers, employees, suppliers, shareholders and communities; truthfulness and accuracy of advertising and sales practices; ethical reputation among industry peers and in communities in which they do business; long-term value of ethics policies to shareholders, customers and employees; and training and communications programs to assist employees in carrying out established ethics policies. 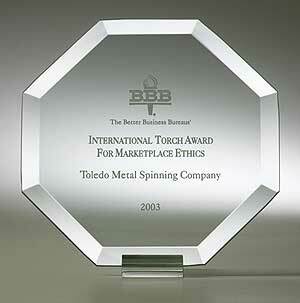 Previous Recipients: For the complete list of winners dating to 1996, the year the National Torch Award was established, visit the BBB central web site at www.bbb.org.